12 shots in 2.4 seconds. 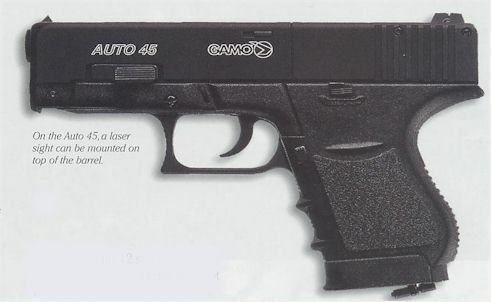 For people that love to shoot, Gamo has made the hottest new semiautomatic C02 pistol in the world. 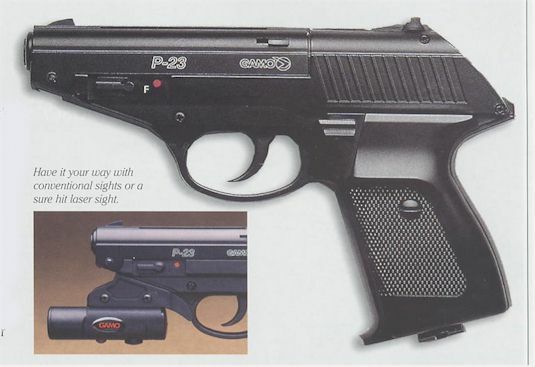 It's called the P-23 and it looks and feels like a standard high powered pistol. 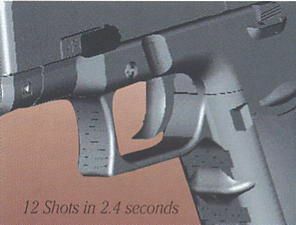 With steel and lead BB's it's a 12 shot semiautomatic and if you are really fast, you can get off 12 shots in 2.4 seconds. For extreme accuracy it shoots single shot 4,5 mm. pellets. The P-23 weighs 0,45 Kg is 19 cm long and sports a 108 mm. rifled steel barrel. It has a muzzle velocity of 125 m/s. which means that you can shoot at a target trap indoors, or go outside for a different style of shooting. 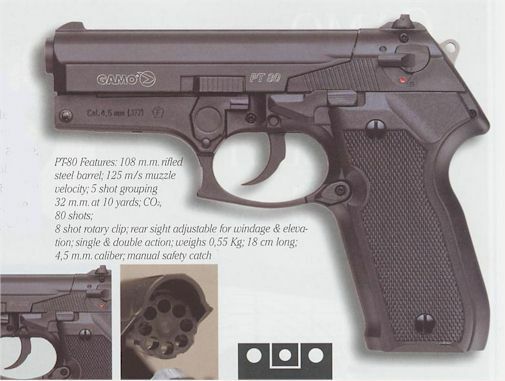 grouping within 21 mm at 10 m; C02 capacity up to 80 shots; rear sight adjusts for windage; weighs 0,5 Kg; 19cm long; 4,5 mm.caliber; double action; and manual safety catch. Loads easily with a single shot pellet or with BR's tor semiautomatic shooting. to aim. You can even shoot accurately from the hip. The pressure of your hand on the back of the grip automatically switches the laser on. The 650 Nm beam is the highest power allowed, plus the focusing lens for the laser diode is glass, not plastic. 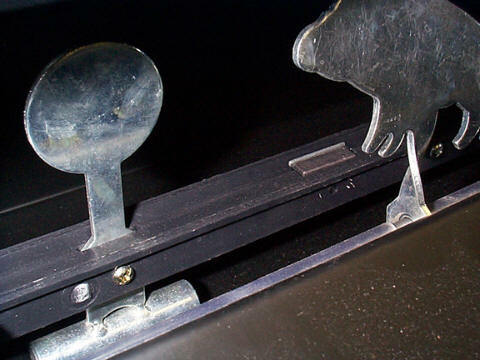 It has adjustable screws for windage and elevation. All this and 115 meters per second. 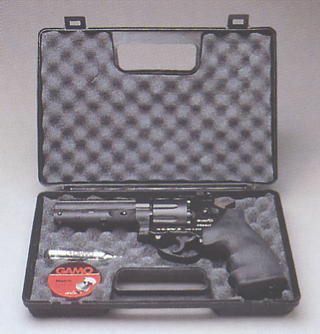 It comes with an easy to carry padded hard case, one C02 cartridge and 250 match pellets. live ammo. They are powered by a C02 cartridge and look and feel like the real thing. 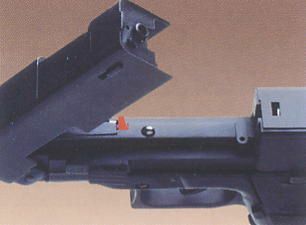 They all have rifled steel barrels; a single and double-action trigger; crossbolt hammer block safety and adjustable sights for windage and elevation. 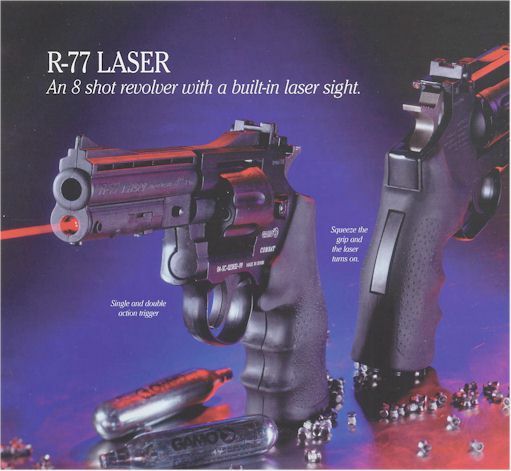 If you love pistols, you'll love these. Just for fun. The R-77 looks and feels like the real thing with its oversized combat style santoprene grip and full length ribbed shroud on its 4" rifled steel barrel. The Snub-Nose R-77 is like the Combat, except for the 2.5" steel barrel. Great for practicing indoors with a pellet trap. The R-77 looks and feels like the real thing with its oversized combat style santoprene grip and full length ribbed shroud on its 4 rifled steel barrel. 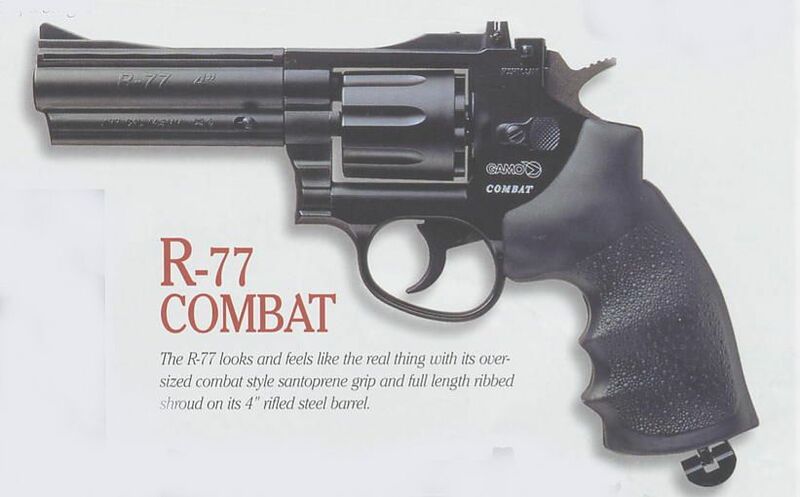 The Snub-Nose R-77 is like the Combat, except for the 2.594 steel barrel. 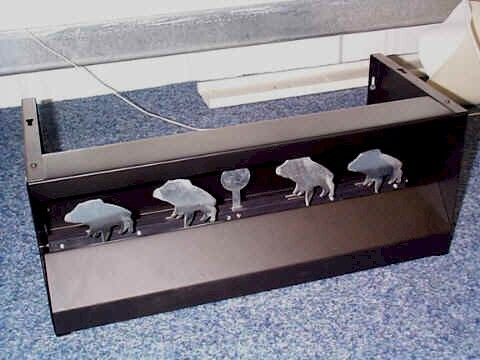 Great for practicing indoors with a pellet trap. 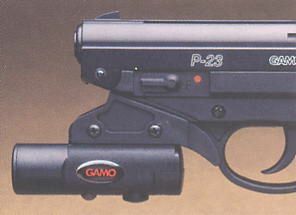 The PT-80 is one of the sharpest C02 pistols that you have ever seen. It's fine detailing is unbelievable. 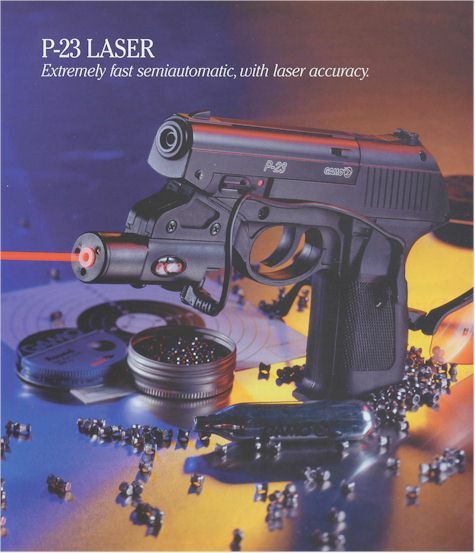 Compare it to any other semiautomatic on the market and you'll agree. You can fire 8 pellets (not BB's) as fast as you can pull the trigger. The barrel breaks in the back to expose a cylinder that holds up to eight pellets. It's a winner. cm and weighs 0,88 Kg. 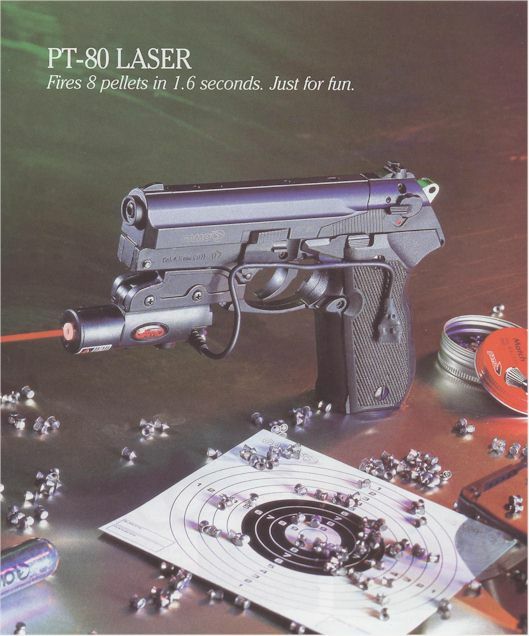 The single-stroke pneumatic power plant of the Compact generates 120 m/s and is also recoil and vibration free enhancing this pistol's pinpoint precision even further. It is truly a world-class performer with a down-to-earth price. The Compact has an anatomical walnut target grip with adjustable palm shelf and lots of stippling for firm control. 3 dot position aiming. Sighting becomes easier with two white dots on the rear sight and one on the front. Just line them up.